The sequel. The second season. It’s always hard to beat the original. Or at least compare. Not only do you have to honor your original but you have to win the audience over and prove that the sequel was worth making. And this second part goes beyond that. In part 2 of Max Cox’s mind-blowing live-action cartoon Kapow-i GoGo, Kapow-i and friends get an action packed makeover where blood will spill and characters will, spoiler alert, meet their untimely demise. 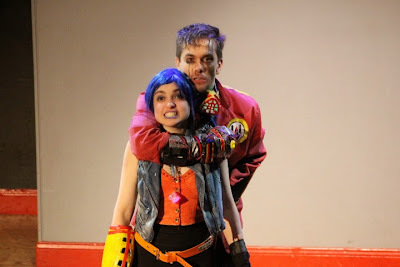 With a turn for the dark, everyone dies and Kapow-i is angsty, and legal, in part 2 of the fan favorite Kapow-i GoGo. All of you favorites have returned with some new additions, both in character and actor. In part 2, Kapow-i, a celebrity, with manager and all, is tired of being a hero until she’s forced on her greatest adventure yet, saving the world again. After Princess Cloudberry goes missing, Kapow-i and Master Masterwhiskeys go on their way encountering a new generation of evil including Madame Blood, the newfound evil mastermind General President Thunder, and the infamous Blade Gunnblade, a hero-villain on a mission for revenge-vengeance. The lighthearted world established in part 1 is gone in a fiery inferno. This Kapow-i has matured and so has the environment. The laughs are still plentiful but the fighting and darkness is equally matched. Cox does a sublime job honoring the origin yet putting a unique spin on the sequel. Cox plays the role of George RR Martin killing off all your favorite characters with zero hesitation. And no one dies more than Andy Miller. No one is safe so don’t get attached to anyone. Spoiler alert, anyone. The cast comprising part 2 is filled with favorites. Madeleine Bundy brilliantly reprises her role as Kapow-i but takes a bit of a backseat for the evil-filled ensemble. Bundy encompasses the typical no care eighteen year old. Her great rival in this show is General President Thunder played with tremendous evil joy by Colin Waitt. Waitt clearly has fun playing the bad guy, and his excitement shows every time he loses. Hank Lin as Master Masterwhiskeys joins Kapow-i again, continuing his desire for a pretty young girl. 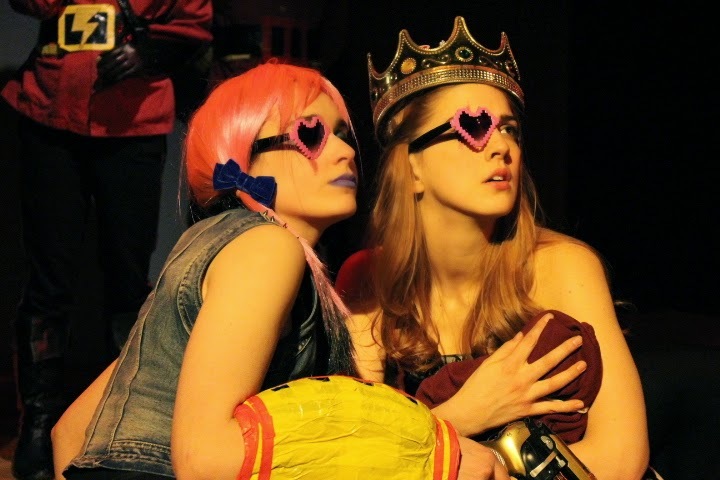 Joining in on the adventure are new characters Princess Cloudberry and Blade Gunnblade played by Eliza Simpson and Asia Kate Dillon respectively. Simpson’s super sweet Princess Cloudberry is adorable and lively. Her swift turns to her dark side are quite amusing. Simpson has a panache for the ingénue role, playing into the stereotype, embodying a Princess Peach-like aura. Dillon’s Blade Gunnblade is a drastic difference from the other characters in Cox’s colorful world, yet somehow, she fits. Looking like Tomb Raider, Dillon is a badass chick with a rich backstory. For those Team Hiccup fans, although he may have fallen down an eternal black hole, Hiccup is back and cyborg than ever! Michael Axelrod’s Hiccup wants revenge on his sister who spent all her time saving the world and not him. His high-octane character gets some intense costume makeovers this time around. Team Trouble is back and ready for more trouble, with Matt Cox and Karsten Otto still on the hunt for all the monies, anyway they can get it. Teaming up with Waitt’s Thunderbolt gives them fun times as minions. Ensemble all-star Andy Miller gets to reprise her role of Woogli but spends the majority of the time playing the oft-dying Police Officer Shelly. Jeff Ronan gets a bigger role in part 2 as the loveable King Cloudberry. He’s loved so much, his demise gets the biggest aw of the night. Evan Maltby’s Tuxedo Gary returns as a champion but quickly gets blasted off the stage, kneecaps and all. His physical work remains a highlight of the piece. Returning with smaller cameos are part oners Tara Pecheco, Cristina Pitter, and Stephen Stout bringing some old and new characters to the stage. Also joining the team is Amy Jo Jackson as the mother of all evil Madame Blood. Her presence is bound to be larger in part three but the taste of nasty that comes in part 2 is sinfully perfect. Rounding out the cast is Alex J. Gould in a high-climbing bit as Koffley the Jester but his work as fight choreographer does not go unnoticed. The production team behind Kapow-i GoGo continue to do a fabulous job bringing Cox’s world to life. The cardboard and duct tape props and costumes are still shining stars, many items returning to action. Keeping the vocabulary consistent from part 1 to part 2 allowed Cox’s departure from the lightness come naturally. With only one part remaining, the Kapow-I brand remains strong giving the audiences a perfect escape from the mundane. Hopefully soon we’ll have access to Kapow-i GoGo action figures, trading cards, and video game!